Appearance: White plummage, bright red hair which is long and often swept up in a ponytail, large crystalline blue eyes, slightly exaggerated features, very tall. Tends to wear bright, outlandish clothing in contrasting colors. Enemies: Counts no one as an enemy. Special Abilities: Extremely flexible, talented gymnast, gifted at acrobatics with extraordinary feats of balance, agility and motor coordination. Also very gifted at putting things together in a mechanical way to form various toys and weapons. Bubbly, eager, vibrant, cheerful, helpful, loving, empathetic. 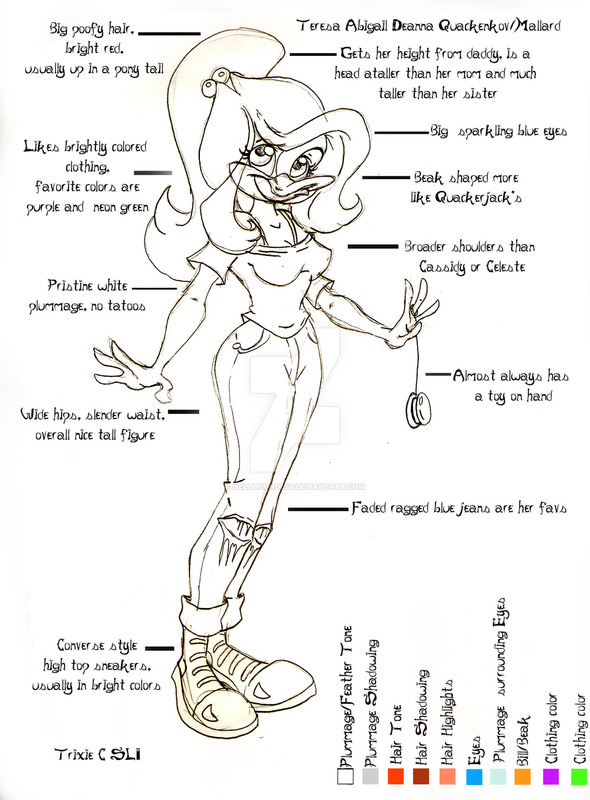 Trixie is the first daughter of Jack Quackenkov (Quackerjack) and Celeste Mallard, the planned for child. As early as the age of two she became a participant doing kindergymrest and continued to progress with extreme talent. Trixie loves the world and believes it loves her back, meeting every day and challenge with bursting enthusiasm. Her parents sheltered her from all the darkness of their pasts and the world as she grew up. Naturally, when Negaduck is your grandfather, no fiend would dare risk threatening or kidnapping you. So who could blame her for not realizing the threat that was born in her own house hold? Trixie was thrilled when her parents brought home her tiny baby sister and vowed to take care of her, helping her learn to walk, often toting her around in her hand me down red wagon. Things changed as the girls got older. Bubbly, excitable Trixie was popular and well-liked by her peers, a cheerleader brimming with school spirit and always ready to lend a helping hand, while inverted Cassidy was tormented and teased relentlessly, something her sister failed to fully comprehend. Years later when Cassidy single-handedly redesigned and rebuilt the Time Top to travel back in time and seek out her great grandfather to train her as an agent of S.H.U.S.H., Trixie tagged along and found herself entranced by the era of Darkwing Duck, vowing to follow in her father and grandfather’s footsteps and become a supervillain. Technology developed by (and nicked from) S.H.U.S.H. allowed her to skip back and forth through time, developing her skills as a masked villain, The Harlequin Menace, until her fateful meeting with one Parker mallard, the next Generation’s Darkwing and no less the son of Drake Mallard and Morgana McCawber. It was love at first ‘click’. Of handcuffs, that is, as Trixie’s romantic interest promptly arrested her. Thus, Trixie began to question her choice to become a villain as Parker introduced to her to the reality that crime HURT people, something she had never considered. Trixie was torn between her loyalty to her family and her love for Parker, a star-crossed love that ultimately drove her to renounce her ways as a villain and briefly become a masked vigilante along side Parker. Little did she realize she was firmly caught in Cassidy’s crosshairs. A vicious attempt on Trixie’s life did not kill her but left her wheelchair bound and paralyzed from the waist down. Even this traumatic event could not forever dampen Trixie’s spirits, and she became the Oracle to Parker’s Nightwing, sort of, working as Darkwing’s computer expert to obtain him information and help his cases. And who knows, there may still be wedding bells and little mini-demon ducks in the future?